Rhenia Island is little known even to Greeks. A place with no inhabitants, ruins of ancient temples and crystal blue waters. 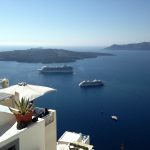 It is one of the few secret paradises in the Greek islands, even though it’s right next to the hyper-popular island of Mykonos. 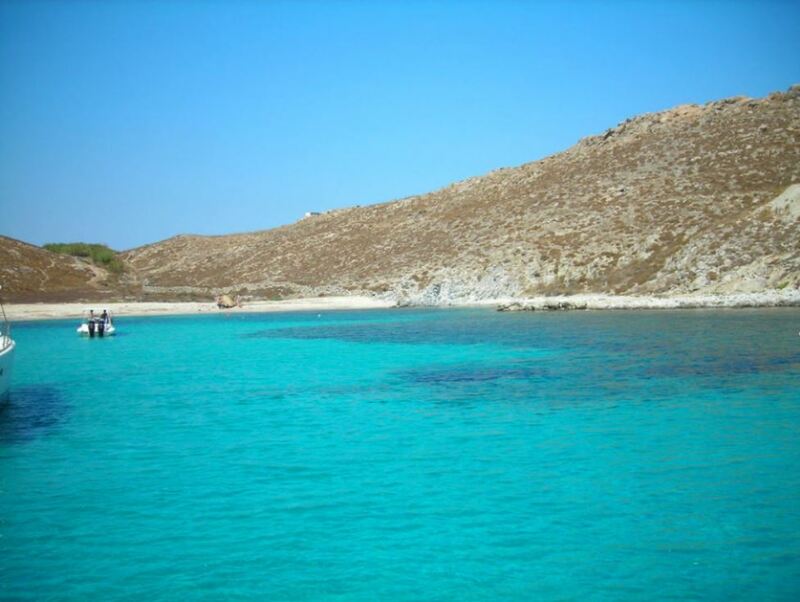 Interested in discovering more information about this little Aegean sea treasure? Let’s get started! 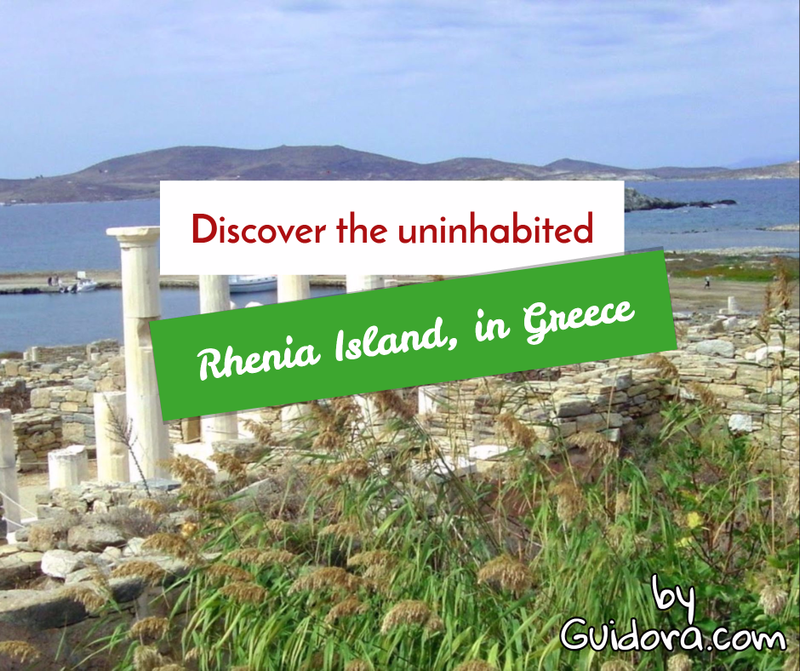 Where is Rhenia (Rineia) Island? 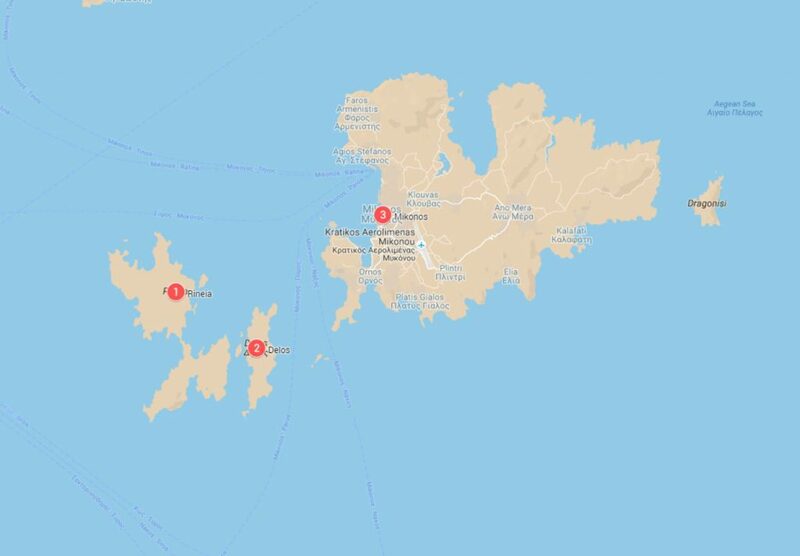 Rhenia (or Rineia/Rinia Island) is in Greece, in the Aegean Sea, right next to Delos and Mykonos islands. 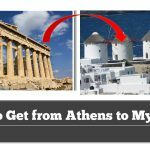 Have a look at the maps below for a more clear view on its position regarding Athens and Mykonos. 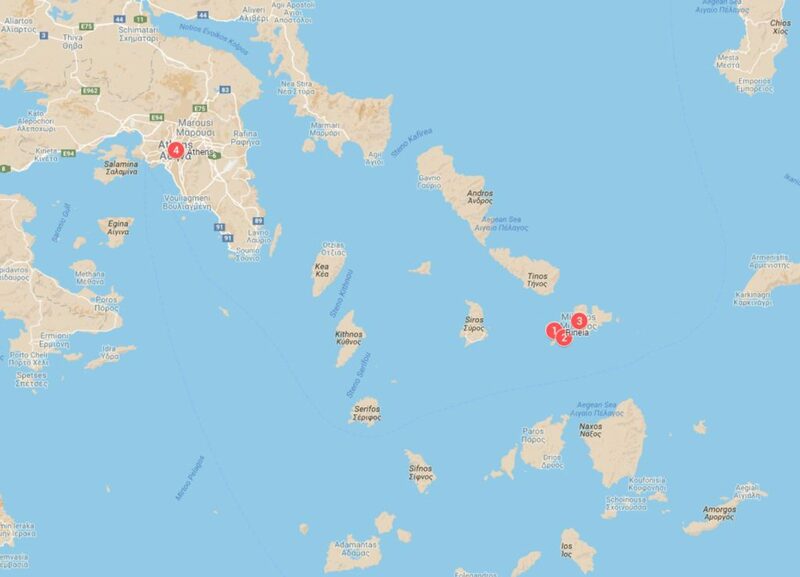 Rhenea is separated from Delos by a small area of sea which is 1km wide. 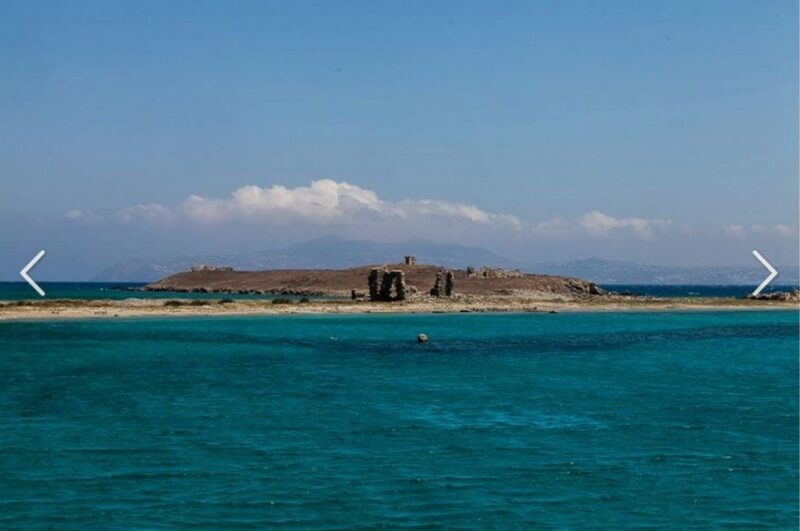 In this little area of sea, there are two rocks (rather than “islands”), which are called “the little Rematiaris” and “the big Rematiaris.” On these rocks, you will find the ruins of an ancient Greek temple and the ruins of a Christian church which dates some 1900 years back. The length of the island is 8km and the coastline’s length is 42km. Rhenia Island had been firstly inhabited some 7.000 years ago! Delos island was the spiritual center of the whole Aegean sea for quite some time, and Rhenia was under its shadow, even though Rhenia is much larger than Delos. 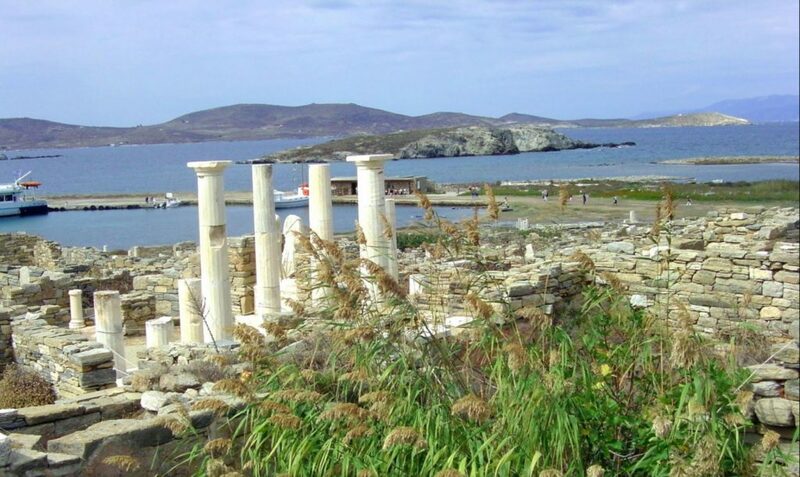 On 530 BC, the tyrant of Samos island, Polykratis, conquered the island of Rhenia and decided to dedicate it to the temple of god Apollon in Delos island. Interestingly, the Greek historian Thoukidedes says that tyrant Polykratis hooked Rhenia to Delos with a 1km long chain. Later on, the Athenians decided that Delos would be their sacred island and that they would have to perform a “Katharsis.” That meant that no one should be born or die on the holy island of Delos. The Athenians opened all the graves of Delos and transferred the bones of the dead into a huge hole in Rhenia. Moreover, there was an ancient “hospital” on the island, where patients from Delos were transferred to. Thus, Rhenia Island was turned into a huge “necropolis”. This hole with the ancient bones of dead people from Delos was discovered on 1900, and you can see them in the museum of Mykonos. Rhenia Island was deserted once Delos fame and glory went down. Nowadays, Rhenia is only a place frequented by goats. And there are around 60 houses which are inhabited by the guards of the ancient areas of Delos island. There are some farmers who rent some land areas on the island and still use the ancient methods of farming. These farmers are staying in Mykonos and not on Rhenia. 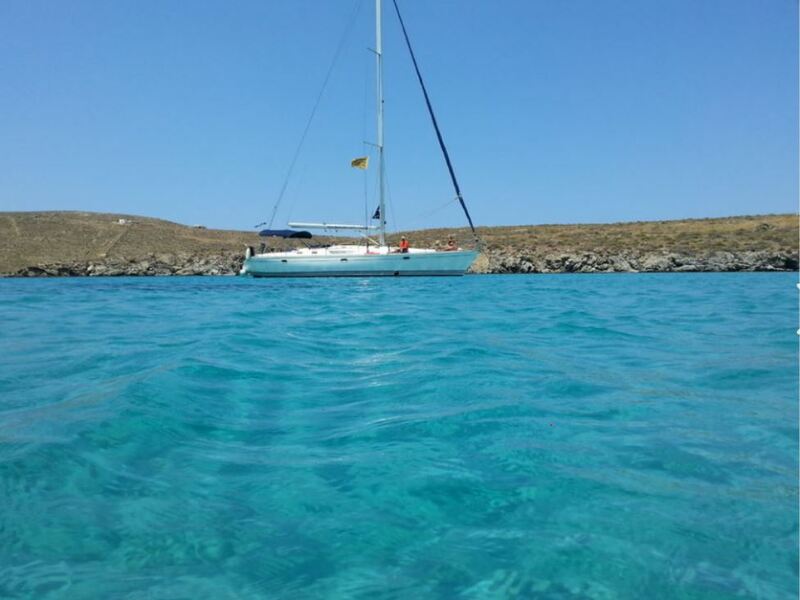 You will get to Rhenia with a sailboat or an organized boat tour, as this is the only way to reach it, so this will give you the opportunity to enjoy the splendid waters of this island. 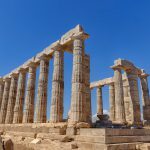 Rhenia is one of the only places on earth where you will see the ruins of the ancient temples in the same natural landscape they were built in, thousands of years ago. There are a couple of churches on the island which have been built during the past century, which are a joy to visit. 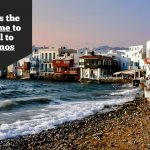 The only way to get to Rhenia (Rineia) is to get an organized tour from Mykonos island. 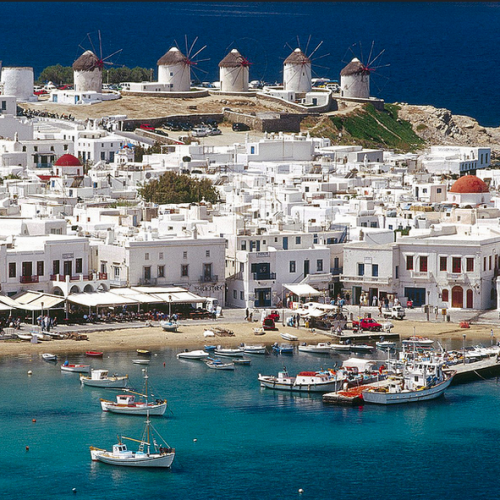 They cost around 70-90 euros per person and they are a “must” experience if you are visiting Mykonos. 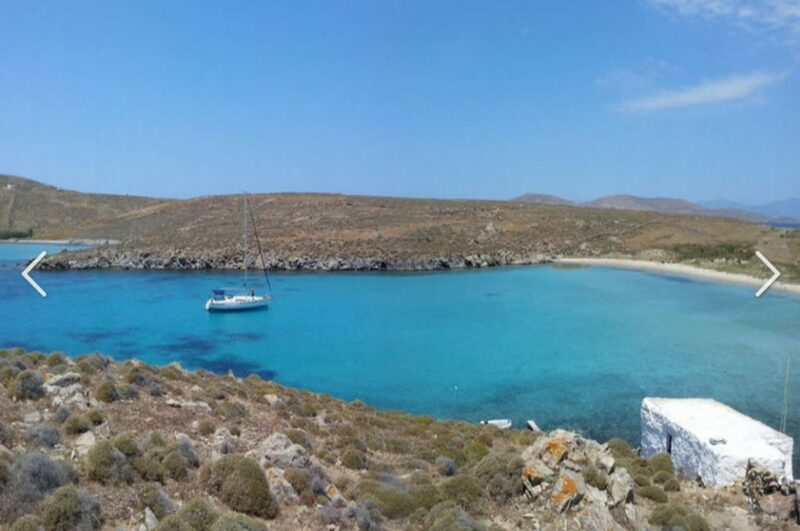 Yes, yes we know…Mykonos is a party island..but do allocate an extra day to pay a visit to Rhenia (and Delos) islands. 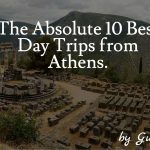 The tour lasts 8 hours, costs around 90 euros per person and you can book it here.